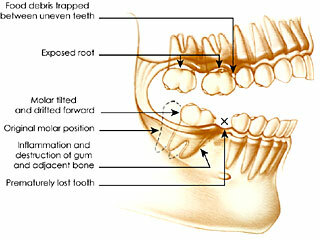 Having to deal with missing teeth is not just about appearance, but it quite often affects speech and chewing ability. Multiple missing teeth may be quite limiting in the type of foods that can be consumed, and can have an affect on ones self esteem and confidence. Dental Implants are today considered the best alternative to missing teeth or deteriorating teeth and avoid the need to wear a denture. Dr Alex Fibishenko from the Centre for Aesthetic & Implants Dentistry in Melbourne, Australia, comments on missing teeth and teeth replacement with dental implants. A single missing tooth can affect the health of the remaining teeth because of natural tooth drifting and supra-eruption that tends to occur when there is no adjacent or opposing teeth present to stop this from happening. Missing teeth were traditionally replaced with dentures that are often loose and uncomfortable, but a more permanent method is available today with Dental Implants. A dental implant is a small titanium fixture that serves as the replacement for the root portion of a missing tooth. 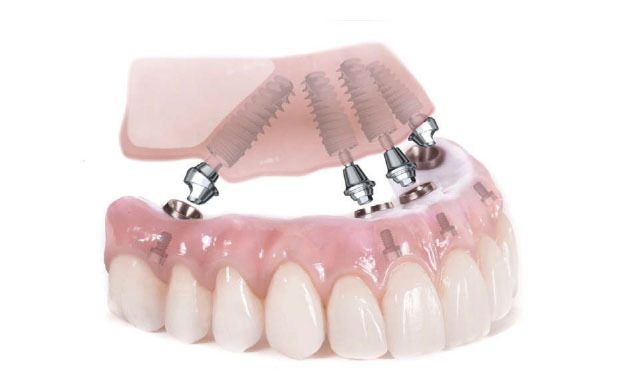 Due to the biocompatible properties of titanium, when dental implants are placed in the upper or lower jaw, they fuse with the bone and thus serve as anchors for the replacement teeth. Implant-supported replacement teeth often look, feel and function like natural teeth. This means that you can eat and drink normally with renewed confidence. The embarrassment, irritation and self-consciousness often experienced by people who have missing teeth or deteriorating teeth or those who wear dentures are overcome with the confidence of permanently anchored replacement tooth or teeth on dental implants. What has changed over time with Dental Implants? Traditionally, the dental implant procedure had been performed in two or more steps. The dentist began by installing the implants, which were left for three to six months to heal and integrate with the jaw bone. During the healing period, the patient was given a temporary denture to replace the missing teeth until the permanent replacement teeth could be fitted to the implants in the next stage. Today, modern implant design and state-of-the-art surgical techniques allow most patients, especially when full set teeth replacement is required, to have missing teeth replaced with a fixed bridge fitted within a few days from the surgery. To get it right, a detailed work-up is done before the surgery to design your smile. After the dental implants are placed, teeth are set in wax and tried in your mouth for aesthetic fine-tuning. It’s completely individualised. You get to approve your teeth before we finish. In certain patients, and when replacing a single missing tooth we may need to wait for the dental implants to fully bond to the bone before fitting the replacement teeth, and we may sometimes also need to improve the volume or quality of bone with bone grafting. Bone Grafting may often be done simultaneously with the dental implant placement, or prior to their placement in a more staged approach. Click here to learn more about the All On 4 procedure. To learn more about Dental Implants and the Centre for Aesthetic and Implant Dentistry click here to visit our main website.